Where can the best industrial scales be purchased? 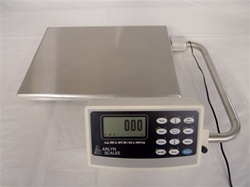 Many industrial scales can be purchased either from a dealer or factory direct. Does a factory direct purchase provide savings? Often the answer is yes simply because the middleman is removed from the equation. Will I get better service if I go through a dealer? Scales that offer automatic calibration eliminate the need for dealer setup and reduce the need for dealer service. 2x scales offer higher levels of accuracy. Invest in such equipment only if your operation actually requires that level of precision. However, such scales optimize accuracy at a modest additional cost. Any benefit to the added accuracy makes the slight extra cost worth it. High resolution scales may offer resolution up to twenty times that of regular scales. Ask yourself, is this more extreme level really needed? Many scales use stainless steel for numerous reasons. Determine whether the stainless steel is of a sufficient gauge or thickness. Epoxy-coated stainless steel may be necessary in caustic or corrosive environments. The proper use of rubber gaskets will help to ensure successful electronics performance in wet or damp conditions. The existence of a warranty and its terms suggest a great deal about the manufacturer’s confidence in its product. Explore the procedures required to process a warranty claim. How will warranty service or replacement be accomplished? Many scales include stainless steel construction. However, extremely corrosive environments require special consideration. Corrosion resistant scales are commonly used for weighing drums of alum, caustics, phosphate, and sodium hydroxide and other corrosive substances. Such scales will also provide long-term service when weighing cylinders of ammonia, sulfur dioxide, fluoride, etc. These scales add a super tough epoxy coating over stainless steel. Extremely hard garnet particles embedded in the coating provide resistance to abrasion. The best industrial scales for corrosive materials will often include these features. The logistics of any industrial operation require careful consideration of the labor costs in using the equipment. For example, depending on the volume of items weighed, even a 10 percent difference in the time required for each action will very quickly eliminate the savings offered by a less expensive scale that is slower to use. Displays that are easy to read will save time. Large backlit LCD displays often work well. Displays with swivel mounts where appropriate will save time. Only over time, that is. As with most investments in industrial equipment, planning for the future will offer savings over time. Aligning scale capacity and anticipated future needs will prevent the premature need to upgrade equipment too soon. One of the best industrial scales for ultra-precise weighing of high weight parts is one that incorporates the use of surface acoustic wave technology. For instance, we have developed a solid state SAW technology that offers an advanced way to provide the accuracy needed in formulating, batching and mixing compounds. Excellent applications for surface acoustic wave technology include superior testing of asphalt, ores, soil, and aggregates. Ultra precise scales that include such technology provide three key benefits when compared to top-loading balances. First, they are generally more rugged and durable. Second, they can be purchased for about half the cost. Third, a substantial reduction in error terms occurs when compared to normal load cell performance. It is certainly worth it to further explore SAW technology. The calibration of industrial scales may be automatic or it may require dealer service. The costs of regular service and calibration should be calculated. In today’s computerized environment, industrial scales that offer some degree of integration into a company’s computer system can add efficiency. For example, Ethernet connectivity or USB memory stick functionality can significantly enhance the accessing, storing, and backing up of critical data. Printers that output on paper, labels and/or cards may be a necessary add-on. The production of labels that will be subjected to extremes of temperature or moisture require consideration of the type of printer that is appropriate. Rechargeable battery packs are often a useful option. For filling operations, a set point controller with appropriate functionality can be vital. Some manufacturers are able to customize the size of a scale to your specifications. This may be particularly helpful when sizing a scale to fit into an existing space. The larger platform scales may be available in customized sizes, for instance. Stainless steel load cells that are top-of-the-line are important in bench scales. They will combine the accuracy and durability that is important with type of industrial scale. The best industrial scales for weighing livestock have a means for averaging readings while the animal moves around. This will provide a very accurate weight, even for very large animals. Durability is key with these large scales. Scales with no moving parts and load cells set in a welded frame will take the abuse that inevitably comes with a livestock setting. Even though these scales weigh large animals, it is reasonable to expect accuracy down to 0.1 lb. Low profile scales make it easier for animals to step on them. Expect multi-year warranties that are important with scales that experience such rugged use. Veterinary scales include many of the same features as the large livestock scales. However, smaller sizes are offered to help to accommodate the birds, reptiles, and other small animals present in many veterinary practices. The addition of a non-slip rubber mat is helpful given the many different animals typically weighed. One creative approach is to offer different size platform scales sharing the same digital indicator. This approach offers savings. It concentrates data in one spot as well. All platforms for weighing animals should feature special non-corrosive coatings. Counting scales can handle parts weighing as little as .0005 lb. For more precision, an ultra-precise scale with the SAW technology may be necessary. The right counting scale for your needs can definitely be a time-saving asset. Look for a counting scale that can store the piece weight of the many different parts that you will weigh over time. Some units can have the weight of literally hundreds of different items ready to access as needed. It is convenient and a real time-saver. Counting scales that can report results in different modes offer needed versatility. Counting scales with no moving parts can be very reliable and long-lasting. Units that offer overload protection are popular. Today, counting scales are available with automatic calibration. No dealer set up is required, making factory direct purchases more viable. The efficiency of crane scales is enhanced by easy-to-view digital displays. Look for 1 inch high graphics. Accuracy of 0.1% of capacity is appropriate for most uses. Given the lifting often involved, rugged construction is imperative. Look for high impact plastics and aircraft-grade aluminum in quality construction. Every type of industrial scale mentioned is available from our online specialists on our web store. We offer factory direct sales of the most popular scales. Our online calculators will quickly guide you to the units that are right for your operation. Our experts are available to further assist you.